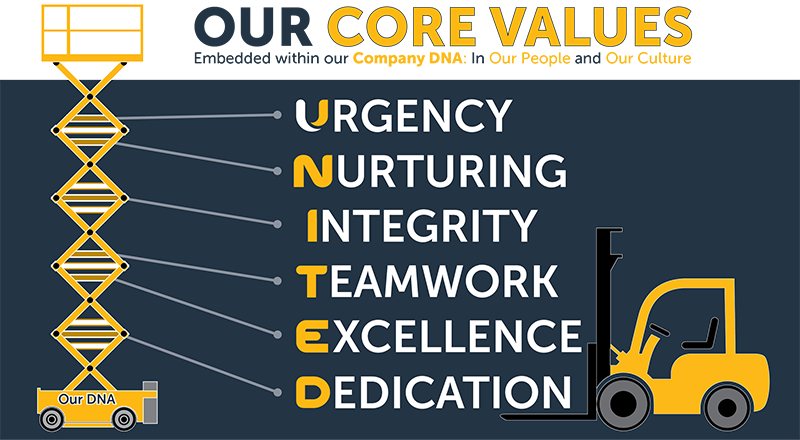 United's Core Values are embedded within our company DNA, in both Our People and Our Culture. Act with a Sense of Urgency for our people and our customers. TODAY not Tomorrow, NOW not Later. Safety First! It’s All About You! Always act with honesty and integrity. A central and foundational core value – Always do the right thing. Working together achieves the best solutions. Effective teamwork demands strong Relationships, Respect, Sharing and Accountability. A central core value – United we stand, United we will succeed. Deliver what we promise and add value that goes beyond what is expected. Quality Products and Quality Service with Quality People. Commitment to apply the best of ourselves to the business, our people and our customers. Never, ever give up. There is always a solution.